*Garam masala, a common Indian spice blend, can be found in the spice aisle in most supermarkets. A mixture of 1/2 teaspoon black pepper, 1/4 teaspoon each of ground cardamom and coriander and 1/8 teaspoon each of ground cumin and cinnamon can be substituted. In a medium saucepan, heat the apple cider vinegar and rice wine vinegar. Stir in the brown sugar, ginger, onion, garam masala, chile pepper, salt and pepper and bring to a boil over high heat. Reduce the heat and cook 6 minutes. Add the peaches and cook, uncovered, stirring occasionally for about 45 minutes to an hour, or until thickened and the peaches are cooked and soft. Taste for seasoning adding more salt, pepper or chile pepper as needed. Store in a glass jar, covered, in the refrigerator for up to 2 weeks. 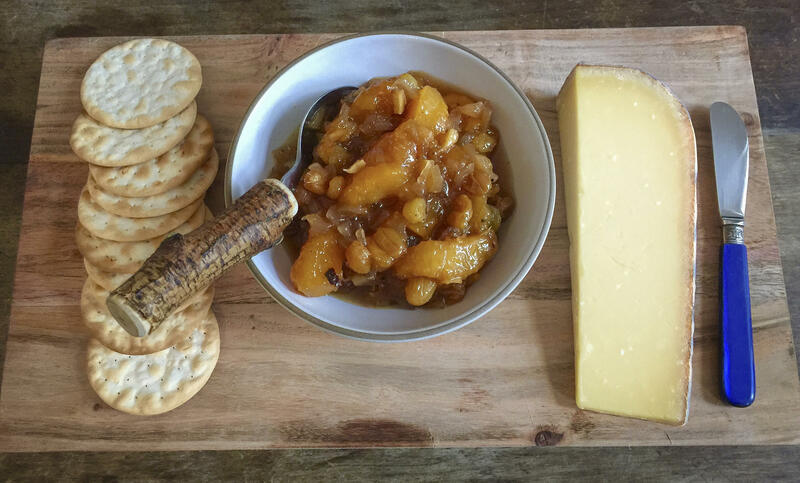 When peaches are ripe and in season you want to keep things simple. A delicious buttery crust, peaches, a touch of sugar and some thin slivers of candied ginger (or ground ginger) makes the perfect summer pie. Make the pastry: In the bowl of a food processor, pulse the flour, sugar and salt until combined, 3 to 4 pulses. Add the butter and pulse until the butter resembles coarse cornmeal, about 15 pulses. With the machine running, add half the water until a rough dough forms and pulls away from the sides of the bowl. If more moisture is needed, add more water, 1 tablespoon at a time. Transfer the dough to a piece of wax or plastic wrap and, using your hands, gently form into a disc, about 2 inches thick. Wrap the disc fully and refrigerate for at least 1 hour and up to overnight. The dough can also be frozen in plastic wrap for up to 1 month. If frozen, defrost in the refrigerator for 24 hours, or until thawed. Remove the dough from the refrigerator and let it come to room temperature for 15 minutes. Lightly flour a work surface, unwrap the dough and, using about 3/4 of the dough, roll the dough into a circle about 12 inches in diameter and about 1/4-inch thick. Gently transfer the crust, flour-side down, to a pie plate. Press the dough into the pie plate and crimp the sides. Place in the refrigerator while you prepare the filling. Make the filling: If the peaches are truly ripe you should be able to peel them with your hands over a large bowl. Simply hold a peach over the bowl and use your fingers to peel away the peel and catch all the juices. Cut the fruit off the pit and cut into slices; remove the pits. Repeat with all the peaches. Alternately you can dip the peaches in a pot of boiling water for 10 seconds and then immediately place in a bowl of ice cold water and then peel. Gently toss the peach slices with the flour, sugar, salt and ginger. Roll out the remaining dough into a rectangle on a well-floured surface. Using a small, sharp knife cut out about 10 to 12 long, thin strips from the dough. Fill the pie crust with the peaches. 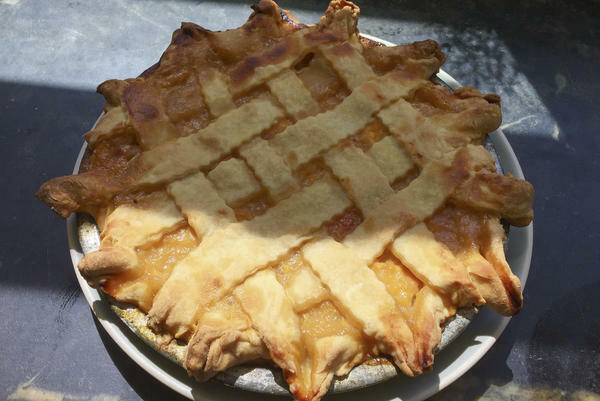 Create a lattice-style topping on the peach filling. Place about 5 to 6 thin strips on top of the peaches leaving about 1/2 inch between each strip. Then add a cross pattern weaving the pastry under and over the existing strips of pastry. Trim the edges and tuck any remaining pastry ends into the crimped edges. Refrigerate for at least 15 minutes. Bake on the middle shelf for 20 minutes. Reduce the oven temperature to 350 degrees and bake another 30 to 40 minutes, or until the pastry is a golden brown and the fruit is bubbling. Let cool for at least 10 minutes before serving. If you’ve been telling yourself that making jam is difficult, find a new story. 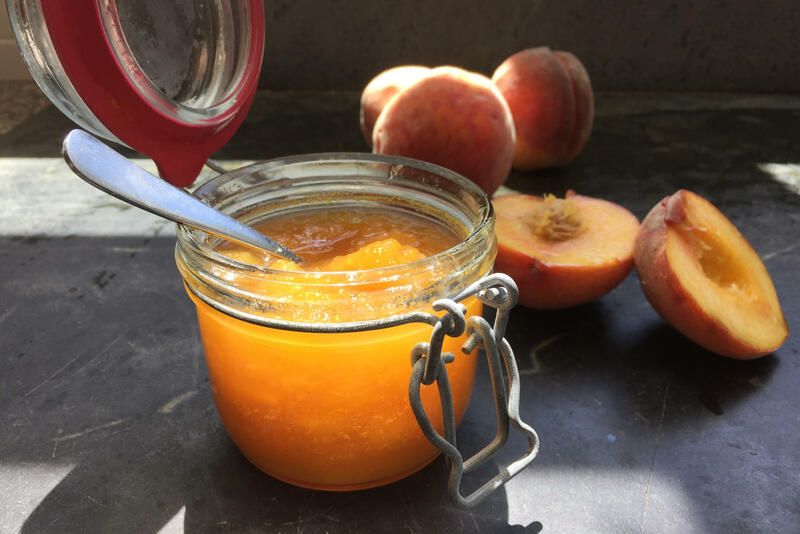 Making jam from summer peaches is simple and takes very little time and effort. Chop some fresh local peaches, simmer with some sugar and lemon juice and, in less than an hour, you’re done. If the peaches are truly ripe you should be able to peel them with your hands over a large bowl. Simply hold a peach over the bowl and use your fingers to peel away the peel and catch all the juices. Cut the fruit off the pit and chop; remove the pits. Repeat with all the peaches. Alternatively you can dip the peaches in a pot of boiling water for 10 seconds and then immediately place in a bowl of ice-cold water, and then peel. Place the chopped fruit and sugar in a medium saucepan and bring to a boil over moderately high heat. 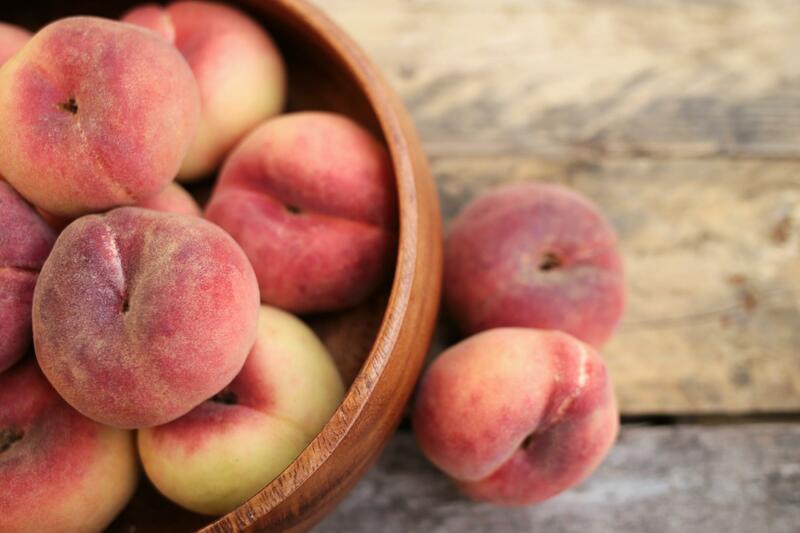 Once the peaches boil reduce the heat to moderately low and simmer for about 30 to 45 minutes, or until thickened. A good test is to place a small plate in the freezer. When you think the jam is ready place a teaspoon of jam on the frozen plate and freeze for about 2 minutes; the jam should thicken and wrinkle when you run your finger through it. If it doesn’t continue to cook the jam for another 4 to 6 minutes. Test again. Place the jam in a clean, sterilized jar, cover and refrigerate for about 2 to 3 weeks. Makes about 3 1/2 cups.